As the 11th annual Science Festival in EEB1 is approaching, the CdE decided to raise awareness about its existence and modus operandi. Students can present their original scientific projects and win prizes; those who win get to participate in the next round of the festival, the ESSS. You will be able to sign up for next year’s Science Festival, and if you are still thinking about it, this article may help you decide. In addition, there will be a livestream of this year’s festival – ask your teachers on the 30th of November to watch it while in class if not at the festival! The ESSS stands for the European School’s Science Symposium. It is organized annually as the second round to the local science festival in the different European schools. At the science festival and at the ESSS students present their own scientific projects ranging from chemistry to biology to computer science. This is our experience of the 2017 ESSS set in Luxemburg. We will never forget those four intense days in Luxembourg. We all woke up Sunday 26 March at around 8 AM, a bit confused by the change of time. After 3 not-too-long hours of bus, where we realized it was Laszlo’s birthday, we finally arrived in Luxembourg, to our Youth Hostel. After settling in the Youth Hostel, we departed to the European School of Luxemburg. There, we began setting up our posters and our stands. At first the place looked a little strange, grey and dark, but we soon got used to it. We asked for some tables and we all set-up our stands. There, we listened to a French speech by Prof. Jules Hoffmann about our immune system. After that, some important looking people gave a few more speeches (In French mostly…) and the opening ceremony was concluded. As we woke up this Monday morning, we know it was going to be a challenging day. Our chance to make a great first impression on the judges. We had breakfast and went to the school. There, we stayed and presented our posters to students. After a while, we were called to go and present them to the judges. The judges allowed us to use our posters and our PowerPoint presentations to showcase our projects. It all went quite well for most of us, although the judges didn’t quite understand the more IT-based projects. At lunchtime, the winners were announced. We were all very nervous, but in the end most of us got through! LaciCloud (Laszlo & Fabio), Adrien’s Allergens in everyday food, Samo and Ivor’s 3D Printing bones made it into the top five. Tuesday 28th was the big day for some of us. 5 projects of the junior category and 5 project from the senior category were chosen by the judges to be presented in front of all the participating students, teachers, judges and faculty. Over 200 in all! All 5 junior finalist presentations were interesting. A team from the European School of Culham presented: The effects of exercise on lung capacity and short term memory. Apparently, by doing a few sit-ups daily, you can improve your short-term memory. A student from Munich explored what knowledge can be gained from measurements of UV radiation. He measured and calculated the effects of geographical latitude, clothing and sunscreens. A student from the hosting school presented an intelligent chair that measures your posture called Postur 3. Both junior presentations from our school came to the finals: Adrien’s Allergens in everyday food, who presented with great passion the challenges which people with allergies face every day, as the food is not adequately labeled. 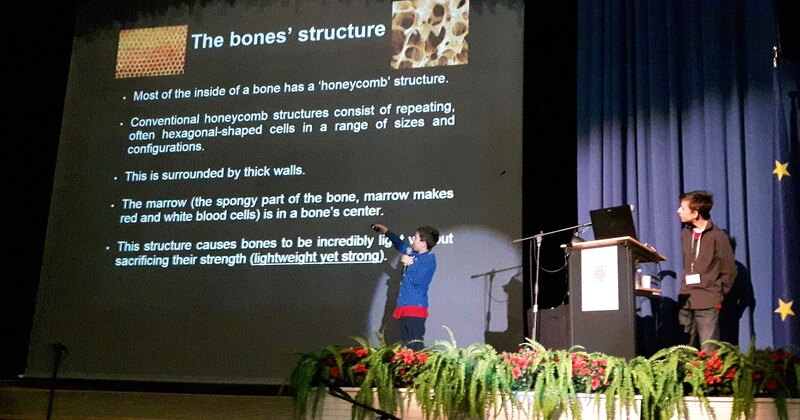 Samo and Ivor presented a project on 3D Printing Bones which assessed different models for artificial bones, associated properties and how to measure them. The senior presentations were also really interesting. The first one was a homemade weather station, which could fly into near-space and measure different kinds of information up there. Then there was a study on how bad sugar is for your teeth (it’s pretty bad). Somebody successfully synthetized painting colors from oil, and the winner studied bacteria and created a self-cleaning door. Of course, the best is for last as Laszlo and Fabio presented LaciCloud (The FTP(s)-based cloud storage service – https://lacicloud.net), which eventually got second place, even though it had originally gotten through as the fifth selected presentation! Wednesday was the day when the European School Science Symposium 2017 came to an end. The closing ceremony was held in the « Salle des fêtes » where the opening ceremony and the presentation of the finalists’ projects were also held. We were lucky to have a closing ceremony full of music played by the jazz group of the European School of Luxembourg 1. The choir was also there to sing some very well-known songs. In between these songs, there were speeches of different people who helped with the organization of the event, important people working in the school and people working on the development of education in Luxembourg. After the last speech, Doctor Steven Weinberg who was a biology teacher for a long time at the European School of Luxembourg 1, made a presentation about the history of underwater photography which was very well made with very nice pictures and explanations. In his presentation, he showed us the research he did and the works of other people who had an important impact on the growth of underwater photography. After all these people passed on stage, the moment we all waited arrived: the notification of the winners in both senior and junior categories. Our school won the first and second place in the junior category (Samo Kobe and Ivor Langus won the first price with their project on 3D printing bones and Adrien Speight won the second price with his project about Allergens in every day food) and the second place in the senior category (Laszlo Molnárfi and Fabio Barbero with their LaciCloud). All in all, we had a great time at the Luxemburgish ESSS. We met lots of people and discovered lots of cool stuff. We were very glad that we got this amazing opportunity to participate in this science festival!